I'm forever being asked by foreigners and natives alike about the Catalan language is and why it was I decided to learn it, so I thought I'd do a wee post answering some of the questions that I'm most frequently asked. 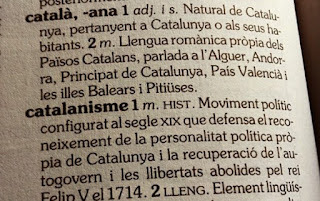 What is Catalan? Isn't it some sort of dialect of Spanish? Catalan is a romance language. Simply put, it emerged from vulgar Latin in the 12th Century, much as other romance languages such as Castillian (Spanish), Italian, Portuguese, and modern-day French. It is very much its own language, with its own culture and history. Furthermore, it actually has a vast literary tradition dating back to the Middle Ages. Blanquerna by the famous Mallorcan author Ramon Llull is considered by some to be the first novel written in Catalan, whilst Martorell's Tirant lo Blanch is said to have influenced the evolution of the Western novel in the Renaissance period. Catalan has around 10.5m speakers in the territories where it is spoken and is very much its own language; it is only similar to Castilian in that it shares similar origins and has borrowed some words over time as more Spanish speakers have arrived in Catalonia and other territories (however the Castilian that is spoken in Barcelona has borrowed some words from Catalan too: feina is often used instead of trabajo in everyday parlance). Broadly speaking, there are two distinct forms of Catalan that have emerged: català oriental (Eastern Catalan) and català occidental (Western Catalan). 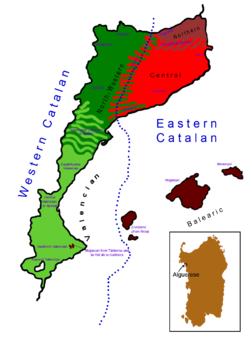 Eastern Catalan is spoken in most of Catalonia (especially in the provinces of Girona, Tarragona, and Barcelona), the historic region of Roussillon in south-east of France, and in the Balearic Islands. The accents between these areas vary significantly, however. The 'central' dialect of Catalan (that which is spoken in Barcelona and Girona - albeit with different accents) is taken by many to be the "standard" form that is taught in most schools and imparted by the Catalan-speaking media: hearing the distinct Mallorcan dialect for the first time was something of a shock to my system whens I moved to Barcelona in 2014 and, at first, was rather difficult to understand (although I've now got the hang of it). Western Catalan is spoken in Valencia (where it is known as Valencian), the province of Lleida, the franja d'Aragó (the Catalan-speaking communities of in Eastern Aragon), and in Andorra (where Catalan is the official language). The debate over whether the Valencian form of Western Catalan is distinct from other forms is one that has got much attention in recent years and given the difference that exists between the Catalan spoken in Barcelona and in Valencia, this is a valid debate; that being said, from a linguistic perspective, there is much less difference between the Valencian dialect and other forms of Western Catalan - say, that of Lleida. Curiously, Catalan (in its Eastern form) is also spoken in Alghero, a port town on the Italian island of Sardinia, where it is the co-official language. Part of Alghero's population descends from Catalan conquerors from the end of the Middle Ages, back when Sardinia was part of the Crown of Aragon. How did you learn Catalan? Where can I learn it? This is a question that I get asked so often here in Barcelona that I'm thinking of having my response printed on a t-shirt: an English person speaking Catalan is still a relatively novel thing for many here. When I was studying Castilian (Spanish) for my A-levels, I decided that I wanted to learn Catalan during my degree. I was fortunate enough to study at the University of Birmingham, whose Hispanic Studies faculty had a wee Catalan section (a lecturer, the wonderful Elisenda Marcer, and a teaching assistant), and so I took Catalan classes there for my first and second years. I got the opportunity to study my third year at the Universitat de Barcelona. Prior to classes commencing, I took a more advanced course in Catalan at the Escola d'Idiomes Moderns of the Universitat de Barcelona so that my Catalan would be up to scratch (and also to get to know the city better). That course was a great investment as around 75% of my classes at my beloved Facultat de Dret were in Catalan, and at the Col-legi Major Penyafort-Montserrat, where I stayed two years ago and am now, many of my friends held conversations solely in Catalan. Needless to say, my Catalan majorly improved during my year abroad (it's now my favourite language) and upon my graduation at Birmingham, I received the Catalan prize. If you want to learn Catalan, then your best bet is checking out your local university to see if they have a Catalan lecturer/teaching assistant. Here are the universities that I know for sure have a Catalan Studies department: King’s College, London; Queen Mary, University of London; and the Universities of Manchester, Birmingham, Bristol, Cambridge, Cardiff, Cork, Durham, Edinburgh, Glasgow, Kent, Leeds, Liverpool, Oxford, and Sheffield. If there's not one near you, get in touch with the Institut Ramon Llull. So, do people in Barcelona just speak Catalan then? No, Barcelona is an (almost) completely bilingual city. The vast majority of people here are equally comfortable in both of the local languages. 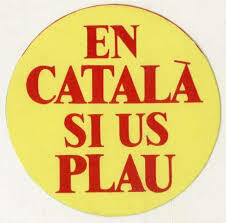 Generally, the way it goes is that if you speak to some in Catalan and they respond to you in Castilian/Catalan, then the conversation will thus continue in Castilian/Catalan; if you speak to someone in Castilian and they respond to you in Catalan but you can't speak it, they will respond in Castilian. I haven't heard of any negative experiences where someone has spoken to a local in Castilian and they have refused to respond to them in Castilian: Barcelona is a very tolerant city and its linguistic openness is one of the things that makes it so great. Contrary to the rumours in the Madrid-based press, speaking Catalan doesn't make you an independentist. There are, of course, many Catalan-speaking Barcelonians (and Castilian-speaking too) who support greater sovereignty for Catalunya and many who back independence, yet, equally, there are many Catalan speakers who are not convinced by the need for independence. Just the simple act of speaking Catalan doesn't automatically mean that you want to see Catalonia separate from Spain, but, rather, that you appreciate this beautiful language and want to ensure its survival. Is it necessary to speak Catalan to study/live in Barcelona? Well, considering that this year I'm studying a Masters here in Barcelona on a course that is 4/5 foreigners and I'm the only foreigner who speaks Catalan, I'd say that, rather regrettably, it's becoming less and less necessary in the higher education system here (at least at the Pompeu Fabra - the UB was very much focussed on teaching in Catalan). Globalisation means that, in many industries and walks of life, you can get by in Barcelona with English and a very basic level of Castilian these days. An ever-increasing number of industries are looking for English-speaking workers these and some are stipulating that workers have at least a basic knowledge of English. Conversely, if you're intending on living here for a period of time longer than just a few months, I would advise you to learn at least one of the local languages - if not both - as it will help you feel much more integrated into city life. My advice would be that if you have a basic knowledge of French, Italian, or Latin, I'd learn Catalan before Castilian as it'll be easier to pick up. 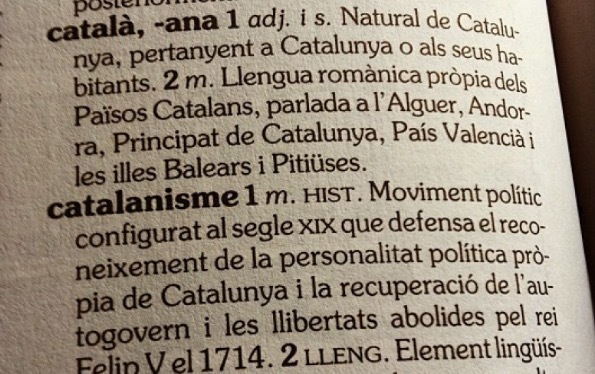 To round this off, learn Catalan: it really is a beautiful language. There are amazing books, plays, music, and poetry out there just waiting to be discovered in this ancient romance language. Of English, Spanish, and Catalan, the latter is my favourite tongue by far.